I did not grow up as a fan of the American Girl dolls, I was rather indifferent to them I suppose. So while you couldn’t say I had any expectations for the debut of the 2014 Girl of the Year doll, I was notably disappointed and sadden by the bland choice for this year. Her name is Isabelle, she has hazel eyes, blonde hair with an attachable pink hair streak, and her outfit is also pink. Oh, and she is into dance. This is very cliche American isn’t it? A cookie straight from mother Dixie’s oven. I had always thought that the dolls were about moments in history, so I looked it up. Mattel has owned the American Girl brand for 15 years, buying it up in 1998 from Pleasant Company. 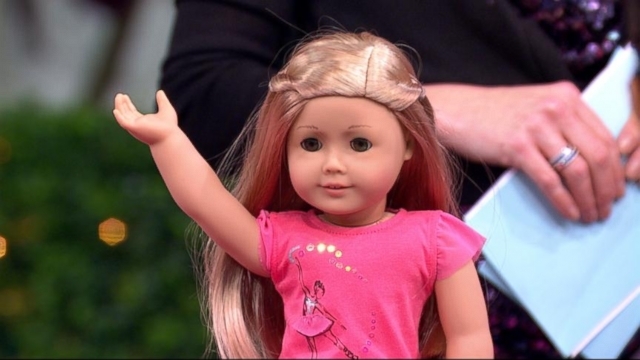 After the Mattel takeover American Girl under went incremental, but forgettable, changes. The company debuted a line of contemporary 18-inch dolls and accessories that has since evolved into the new My American Girl. The first really notable change was in 2008, when Mattel decide to archive the original dolls and rename them “Historical Characters.” This means that dolls with stories that illuminated on controversial and important moments in history- like Samantha, Kirsten, and the headstrong colonial girl Felicity,- that made up the core of the “The American Girls Collection” are no longer sold by American Girl. The archiving of Historical dolls freed up funds to market the customizable My American Girl and the annual Girl of the Year dolls. These product lines feature blander avatars to little girls, reflecting only the present time period and appearance of “contemporary girls.” This is right off their website: “The My American Girl product line lets every girl create a truly special doll that’s just right for her, then bring her doll to life in a safe, enriching online world that promotes learning and helps girls to be their best.” Really? A truly special girl, just like her, that promotes learning in a safe online world. How can a doll that is “just like her” really challenge your daughter to explore ideas and topics outside of her awareness? The historic dolls represented more than just the origins of an iconic brand, they allowed girls to see themselves in the thick of the action. They were doing rather sitting on the sidelines. The systematic archiving demonstrates a lost sensibility about teaching girls to understand complex historical controversies AND how use that understanding to become builders of a continually progressing social and political consciousness. When compared to the historical dolls, the contemporary dolls lack dimension, interest, and dynamism. These are qualities that help children understand that they have the potential to do more than be a part of their small part of the world- they can reshape it. Take Saige, McKenna, and Lanie. These are three previous Girl of the Year Dolls, that are nothing more than recycled attributes plus or minus a superficial element. All three are white; upper-middle-class. Saige is a dancer, McKenna a gymnast, and Lanie is an amateur gardener and butterfly enthusiast. In their attempts to encourage spunky and active girlhoods, Mattel approaches problem solving in a highly local way. One has a bake sale to help save the school arts program, Lanie persuades one neighbor to stop using pesticides and Isabella balances school work with her dance lessons (I think McKenna learned the same lesson about time management but with gymnastics instead). They also undergo emotion development by overcoming jealousy, insecurity, and bullying. Great. But none of these girls faced situations that brought them into contact with real social issues or physical and emotional hardship. Before the rebranding, American Girl characters faced real social real controversy and the girl’s solution had meaningful, resounding impact. The very first American girl doll was Samantha, an orphan raised by her grandmother during the Edwardian period. Themes in Samantha’s books include women’s suffrage, child labor, and classism that were dealt with through her friendship with and rescuing of a serving girl. Molly McIntire is a young girl of Scottish descent, living in Jefferson, Illinois during the latter years of World War II. Her father is doctor stationed in England caring for wounded soldiers, and Molly must cope with changes that war has brought. She realizes that she can do something to aid soldiers and she and her family host an English girl immigrating from the war zone. Kirsten Larson is a Swedish immigrant who settles in the Minnesota Territory with her extended family. She faces actual physical risk posed by the challenges of settling a wide territory and adaptations necessary to adjust to life in America- like ya know learning to speak English. These earlier dolls deal with immigration, displacement, women and children’s’ exploitation, and hard work. These girls grow from their situation. Compare that to Isabelle who enters a dance competition but then starts to do poorly in math (she’s poor at math! why math? why can’t she be bad at home ec?). She is just like Marisol, another dancer, plus a bit from Lanie or Kailey, or both who can tell?, with a different outfit. Sure, her story might inspire some little girl to be the next greatest dancer or choreographer, but more than likely most parents will find that they have wasted their money on lessons their daughter quit after a few weeks. *sigh* Ok on the real, there’s nothing wrong with young girls learning about good time management early on, but seriously, how does Isabelle’s story make her different in some way from the “average” girl reading her book? How is this young reader compelled, motivated, or enlighten? She’ll learn about bullying and dedication to accomplish goals, but did she learn about immigration reform or LGBT rights? Gun violence in school? Or let’s talk about creationism vs evolution in schools! Or even about freaking global warming?!!!!! Those are things that real American girls do face every day. Where’s the girl who as two dads or a mentally ill sibling? The current catalogue leads off with the My American Girl offerings, followed by “Dress Like Your Doll” 2013 Doll of The Year,’ and ‘Books and Magazines.’ Only when you get to the fifth section, on page 38, do “Historical Characters” make an appearance. 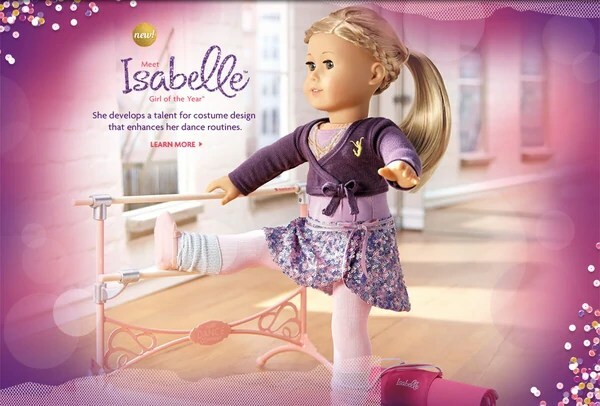 And on the website the homepage features matching doll outfits, dresses for girls so they match their doll, the current product line, and the online game for our 2014 Girl of the Year, Isabelle. Essentially, historical dolls are afterthoughts. So why doesn’t Mattel feature a doll who has a parent, maybe a mother, fighting in Iraq? Or just a girl whose not white? (there’s only been two black character dolls—one a slave girl!— and NO Asians, Ivy doesn’t count cause she’s Julie’s BF, not a main character with her stuff), and for the contemporary lines there’s not much to cater to girls with darker skin either. In the end, the dolls are $110-$200. Mattell knows who they are marketing to, and its not to every American girl. Heck after reading the comments its not even to girls, it looks like its mostly old ladies buying them up. Also, does no one else think dolls are just plain creepy? She has the devil’s eyes!